PRC set to released the August 2013 Veterinarians Licensure Examination results a few days after the last day of exam. August 2013 Veterinarians board exam results is also known as Veterinarians board passers this August 2013. You can view here the list of passers. 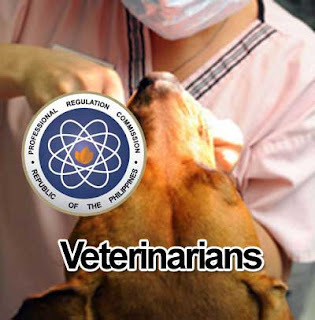 Veterinarians Board Exam will be held in the cities of Manila & Cagayan de Oro this August 20, 21 and 22, 2013, under the Board of Veterinary Medicine. Veterinarians Licensure examination is conducted once a year by Professional Regulation Commission (PRC). Last year, PRC announced the 230 oassers out of 703 examinees of the veterinarian licensure examination. (Updated: September 25, 2013 - 12 pm) The Professional Regulation Commission officially released the Veterinarian Licensure Examination results with 242 out of 611 passed the exam. September 2013 Veterinarian Board Examination, please click the link here to view. Thank you for reading this post, If you like this details, please bookmark it now or visit this site more often for you to be updated. You may also share this post to your friends so they may know about August-September 2013 Veterinarians Board Exam Results. Comments or suggestions about "August 2013 Veterinarians Board Exam Results | Veterinarians Board Passers August 2013" is important to us, you may share it by using the comment box below.